– You’re having a giraffe, aren’t you? 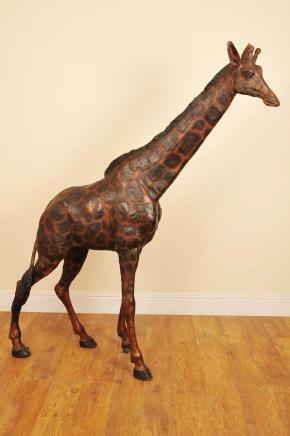 Or perhaps a pair of giraffes? 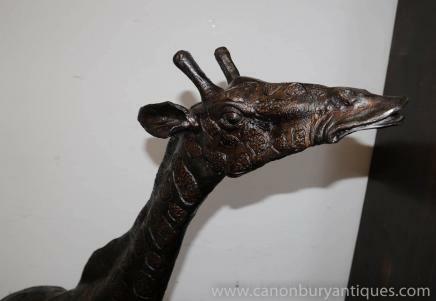 You are viewing an bronze African giraffe. I hope the photos do this stunning and unique piece some justice, it’s cetainly more impressive in the flesh. It would make for a really unusual garden ornament. Of course being bronze he can live outside okay with no fear of rusting. Check out the quality of the casting, particularly details like the muscletone and facial expressions. We bought this from an architectural salvage firm in North London after it had been purchased from a local house sale. He’s offered in great condition ready for home use right away.